The reason these points are important is that we can optimized write operations for the best performance, but we can’t out-optimize their inherent design. If we have to remove 100 records against a table that will cause fragmentation because of how our records are organized, no common table expression or subquery will subvert the minimum cost required by the transaction. We can use this tool for helping us reduce the cost to as close to minimum, but each write operation will come with costs. The above scenarios tend to be more common in data warehouse (OLAP) environments and like with other transactions, we have alternatives that may be more appropriate. For an example of an insert with common table expressions, in the below query, we see an insert occur to the table, reportOldestAlmondAverages, with the table being created through the select statement (and dropped before if it exists). Our created report table from the two CTEs joined. The CTE in SQL Server offers us one way to solve the above query – reporting on the annual average and value difference from this average for the first three years of our data. We take the least amount of data we’ll need to use in our first common table expression, then get the average in our next, and join these together to return our report. The above insert statement also illustrates a development technique that we should apply to all data operations – filter as early as possible and use as little as required with data. We don’t want aggregates being run against a full table, if we only want to run an aggregate for a small timeframe. While SQL CTEs can make development easy, there is a tendency to get everything early, then filter later (this is also common with other data operations too). The better development technique is to filter as strict as possible early so that we return the fewest data points we need, from unnecessary rows to unnecessary columns. This especially becomes true if we migrate data to another server and our query is involved in a linked server query. Like with other transactions including select statements, the data from the wrapped query inside the parenthesis is inserted, meaning if the wrapped query has 100 records, 100 records will be inserted unless a where excludes them (the actual columns are determined by what is selected). We can use common table expressions to update data in a table and this becomes very intuitive when we do updates with JOINs. Similar to other operations, we will use a wrapped select for the data we want to update and the transaction will only run against the records that are a part of the select statement. We’ll first look at a simple update, then look at the easy of doing a joined update. In the below example, we first add a column to our table that allows 9 varchar characters and we use a SQL CTE to update all the records in our table to a blank value (previous records were null values). Following what we’ve learned in inserts and selects, we only select what we want to update and nothing more – we always want to get in the practice of returning the least amount of data we need (both for performance and security). Once we add our column and update our records to blank, we can used the wrapped query inside the common table expression to check our blank values. We can run a validation after we run the update by highlighting the query inside the SQL CTE. If I had specified top 10 or had added a where clause for only 10 values, the update would have only run against those 10 values. This becomes incredibly useful to limit the scope of updates with our select statement inside the SQL CTE specifying the exact records to update. Next, we’ll create a quarter table that we’ll use for an update CTE in SQL Server, with a join and insert four records. 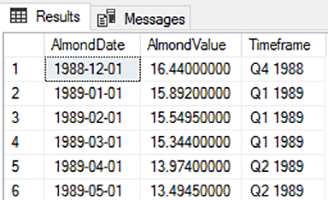 For our update, we’ll join our tbAlmondData to our newly created QuarterTable on the quarter part of the AlmonddDate (we could run this update by using the DATEPART function alone, but this example will also show how we can use a join statement to make updating easy with SQL CTEs). We want our new timeframe column to hold the value of QN YYYY, such as Q1 1989. For our select statement inside the common table expression, we’ll select our Timeframe column (which will need to be updated) as well as the varchar combination of QuarterValue and casted year of our AlmondDate column as a varchar of size four. We can check how the existing Timeframe column and how the NewTimeframe column look before we run the update. Using the joined query, we update our timeframe column. If we needed to update one column that would be created from three joined tables, we could apply the same logic in the above query – join our data in the wrapped select statement with the existing record and the new record we need to update the existing record to, then run our updates. Not only does this allow us to run a quick check before we make an update – because we can select and run the wrapped query – it means we can use the intuitive design of joins when updating data with selects. In a similar manner, by choosing CTE names that capture what we’re doing and using column names that indicate the existing versus new, the SQL CTE itself explains the update with little confusion. We see that we can quickly create insert and update statements with common table expressions and organize our data easily. We can combine these with other development techniques, such as temp tables or transaction-based queries, to simplify our troubleshooting if we experience issues. Like with large select statements, SQL CTEs may have drawbacks if we stack too many of them on each other, as we won’t have the convenient ability to query the wrapped data. In addition, we may still find situations where we don’t want to use these, as they don’t offer the best performance.